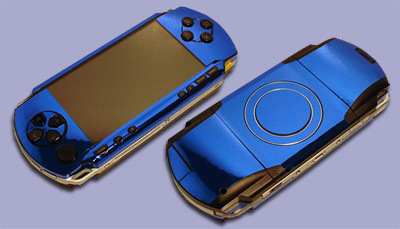 A new skin for your Sony PSP by VinzDecals | OhGizmo! By David Ponce on 03/06/05 • Leave a comment! So you just couldn’t wait, could you? You just had to have the PSP before everyone else. You just happened to have a little truckload of money lying around and you got one imported. And now… well now you’re sick of the way it looks already. Well, fear not. Company VinzDecals is making a bunch of skins for your shiny toy so you can pretend you just bought it and fall in love with it all over again.